Yields from cocoa in recent years have been dwindling as a result of illegal mining activities in Ghana. This has had a major effect on large tracts of arable cocoa plantations. Communities that were once noted for cocoa production are now impoverished after farmers sold their lands to illegal miners for money. 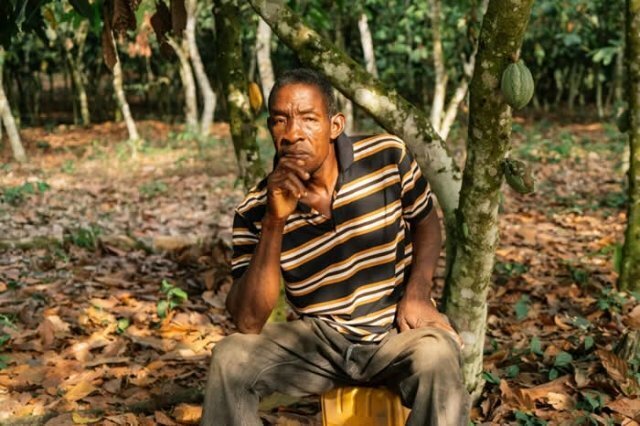 The situation has resulted in an economic downturn in cocoa farming communities. Illegal mining has been a major cause of Ghana’s dwindling cocoa production, however the steps taken by the government to ban small scale mining and review all mining licences has been quite successful in reducing a further extensive impact of the practice on cocoa production. Currently other major concerns which we project will have a long term impact on Ghana's cocoa production is the trend of farmers moving into growing cashew, and opting for rubber plantations. Ghana Rubber Estate Limited (GREL), a company in which the Ghana government holds 25 percent of the shares has acquired more than 51,000 acres of land which it is developing into rubber plantations. Most of these lands which were already being used to cultivate cocoa are being cleared to make way for rubber plantations even though the cocoa trees haven't ended their 30-year life span. GREL and other Rubber companies have offered cocoa farmers very attractive incentives to go into rubber plantation since cocoa farmers are highly overburdened with huge operational cost including high price of farm inputs especially fertilizer among others. Despite the fact that Ghana is the second highest producer of cocoa, its farmers have not benefited substantially from its cultivation. Cocoa farmers earn a per capita daily income of approximately USD $0.40-$0.45 on cocoa. This amounts to an annual net income of USD $983.12 - $2627.81 and accounts for two thirds of cocoa farmers’ household income according to Cocoa Initiative. The profitability in cocoa farming is therefore on a rapid decline as a result of low earnings coupled with weak economic resilience. According to the government of Ghana, it plans to help make cocoa profitable enough so the land owners will not give their cocoa lands away. The government's stance on taking steps to make cocoa production profitable again further depicts the extent to which cocoa production has not been a profitable venture to farmers in Ghana, hence their need to find alternate use for their lands by switching to rubber cultivation or selling their lands to rubber companies in order to be able to meet their household needs. Though only a fraction of Ghana’s 1.7 million hectares of cocoa has been converted to rubber plantations, if left unchecked, will spread to different parts of the country and make Ghana lose its position as Africa’s number two cocoa producer with time. Cashew production is also another major trend which is currently swaying more farmers from the cultivation of cocoa in various farming communities. Cashew has now become an attractive alternative crop for a lot of farmers. A kilo of cashew nuts sells at Gh¢8, and a hundred-kilo, Gh¢800; slightly above cocoa. Farmers are therefore beginning to become very optimistic that cashew production is going to alleviate their communities from poverty. Cashew production on the other hand has been linked with poverty reduction and has become a more attractive venture for the youth who wish to engage in farming, according to African Cashew Alliance. An increase of 25 per cent in value-added cashew products would have a great impact on poverty reduction, generating over $100 million in household income for rural families. Ghana’s cashew sector is now the leading agricultural non-traditional export, with a total amount of $197 million worth of export revenue in 2016, representing 53 per cent of the total revenue of $371 million. A shift into cashew and rubber cultivation by farmers are major trends which are likely to impact cocoa production in Ghana in the mid to long term if steps are not taken by the government to curb this. Cocoa farming must therefore be promoted as an attractive agribusiness venture by the government to help entice more of the youth especially into its cultivation to make up for aging farmers and curb the sudden shift of farmers into cashew and rubber cultivation.